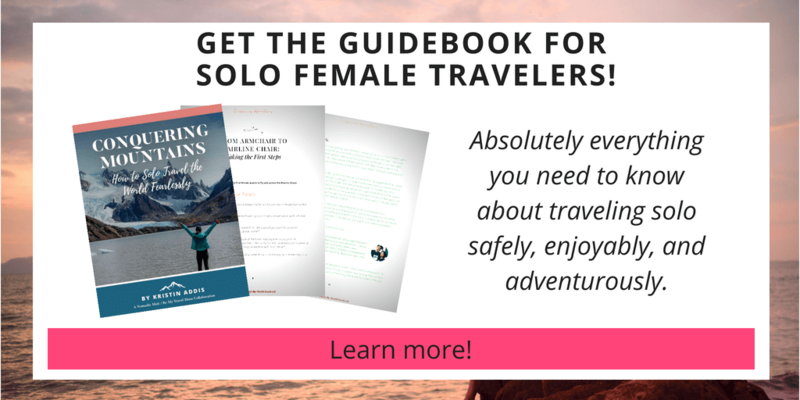 Lately I’ve been meeting more solo female travelers on the road (yay! ), and asking about their stories. I love learning what motivates someone to travel alone, whether it’s the freedom, the desire to heal, or because it’s just the best way to travel. Ever. Though they obviously decided to make their dreams a reality, during these conversations I came to realize how many of us have pushback when we share dreams of traveling, especially as women, especially alone. How many more women are still at home, talked out of their dreams? The arguments can be pretty convincing: it’s too dangerous, when are you ever going to settle down and have a family, aren’t you worried that you won’t be able to get a job anymore if you just take off like this? What about money, what about security, what about your five year plan? 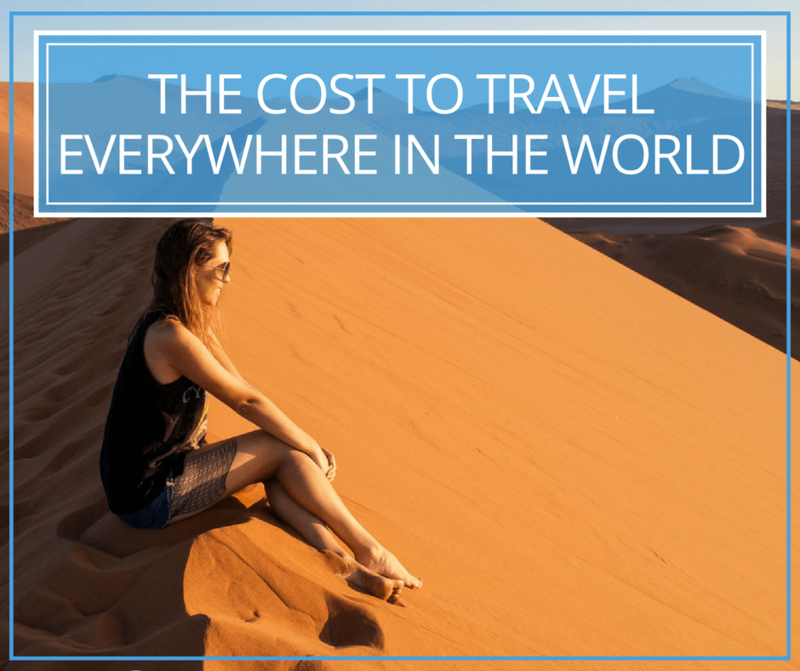 But the truth is traveling abroad is often less dangerous than living at home, staying safe is not that difficult, not everyone wants to settle down, and even if you do, taking off for a few months or years on a trip is not going to ruin that. Making a five year plan is a waste of time, and if I’ve learned anything from all of the European gap-yearers and sabbatical-takers I’ve met on my travels, taking time off is healthy, and if you spin it correctly on your resume, does not spell career suicide. Rather, it strengthens your resume. The truth about naysayers is, you’ve pushed a button. Your boldness has threatened them right in the place where they wish they could be like you. Whether it’s conscious in them or not, you’ve awakened a fear in them that they’re not living up to their fullest potential, they aren’t brave enough to do what you’re planning to do, and they’re scared they will never have experiences like that. Even if they mean well. Even if they’re your closest relatives or friends. Even if they have no idea this is the real reason behind their desire to talk you out of it, the truth is you’re not getting their support because you’ve inspired fear in them of a life not fully lived. If you take off and prove to them that you’re totally capable, then you won’t need them to protect you anymore. If you have an amazing trip and come back to find an even better job than the one you left, then they’ll be totally wrong that it’s career suicide. 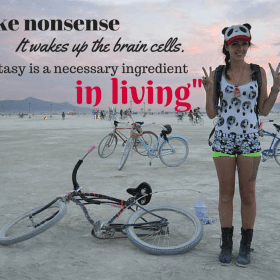 If you meet someone amazing on your trip and decide to ride off into the sunset with him or her, then they’ll be wrong that you should have stayed and settled down (like maybe they did). It’s true, and if your dream scares you, be prepared for it to scare the hell out of others too. And that’s okay. It doesn’t mean you have to do what they say. At the end of your life the only person responsible for it is you. Personally, I want to know that I left no stone unturned. I want to leave this life without any question about whether I really lived it or not. I want to approach life unafraid of it, knowing that how much I enjoy it, how many meaningful moments I experience, how many times I say ‘wow!’, and how many incredible adventures I have, is up to me. This isn’t anyone else’s coin to spend. I can’t let others decide things for me. I can’t let others’ fear keep me from living in love. I think that we owe it to our naysayers to go and have that adventure. It’s our duty to show them that the world isn’t scary, that we are capable as women traveling solo, that we shouldn’t be subdued or held back, and that they have those qualities present in themselves too. We owe it to our naysayers to succeed. To inspire them. To show them that anything is possible. Ready to go it solo? 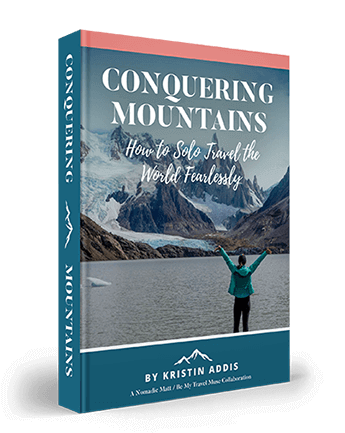 Check out the brand new and improved Conquering Mountains: How to Solo Travel the World Fearlessly, with expanded sections on booking flights, maintaining a budget on the road, specific tips on dealing with fears, even more advice and case studies of other solo female travelers from all over the world. So true. If they’ve taken a leap of faith and it worked out they’re more likely to be your biggest cheerleader. I love this. No regrets, “don’t blink” or life will pass you by! Living by example, shutting down the naysayer’s words through living your dream and educating him/her through your positive actions and attitude. You must be accurate, Kristin, because some of the worst naysayers I’ve seen years later are traveling everywhere! It is almost like he/she are trying to find a way by discouraging you to discourage him/herself from doing it and you are taking that away from them and then they take the plunge. Some people unfortunately do this to put you down or have ill intent, but most of the time the naysayer at least cares. The ones that bother me the most sometimes are those who don’t care. “Hey, I’m going to skydiving this weekend, can’t wait!” and the reply is in an apathetic tone, “that’s nice” or “whatever”. 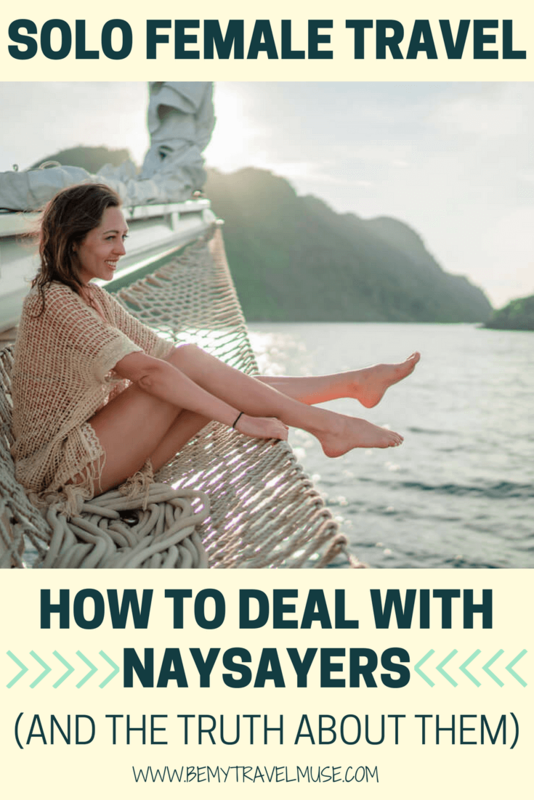 The naysayer often wants to be part of your life or share it in a warped way, even if annoying and controlling. Many just don’t understand or are engulfed in fear; we can help! Last thing, even if discouraged by those around you, it is great to have a nice community like the one here to lend support! P.S. Some of the greatest inventions and discoveries, and greatest sports stories came out of those who followed their gut and ignored the critics (although don’t want to be stubborn, a know it all, and not take any constructive criticism). I love this! It is so true! At the age of 51, I began 5 years of traveling…first road tripping America then backpacking abroad…solo! Friends & family all had those questions/fears….”What will you do when you run out of money?” ummm….I’ll get a job. “It’s dangerous!” No….no more so than here. etc etc. I did run out of money so came back home & immediately landed a great job (even at my age…that did surprise me!) that allows me to work while I travel for a couple of months each year. I’m house sitting for a friend who retired to Italy….all of the expenses are paid by him!! So I’m saving my money to get back out there again &, in the meantime, am taking a couple of vacations a year PLUS 2 months work-traveling. Life is good & I can’t imagine never having followed my dream!! I love this! Just goes to show that trusting yourself and your dreams leads you right to where you’re meant to be! Love this post, Kristin! “I can’t let others decide things for me. I can’t let others’ fear keep me from living in love.” – that line resonated with me so deeply. Thank you for the reminder! 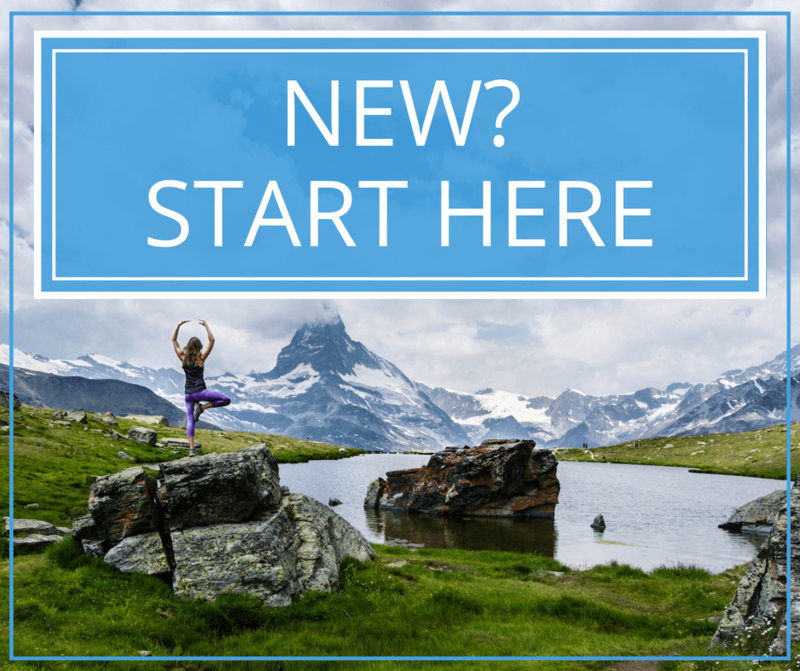 I came across your blog through frantically searching for advice and ways to make my future nomadic life work. I’m from New Zealand, I have 2 grand saved, a backpack and a flight to Australia booked in Jan to start travelling. I have no set plans yet, apart from staying in hostels and finding some work to save and travel further. So far most of my friends and family have been disapproving, not understanding my thirst for adventure and need to overcome fears. I feel envy is a large part of peoples negative reactions. But the way I see it is, It is what you make it and if you work hard there’s no reason you can’t make it work. Thank you for your post. 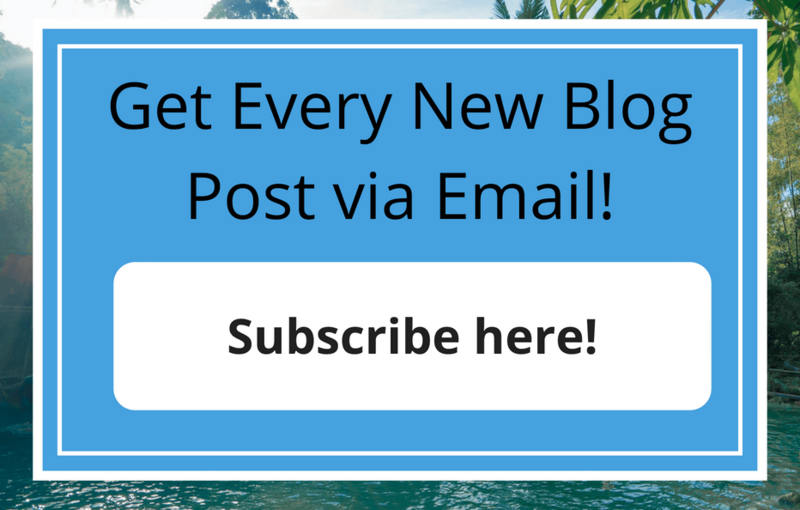 This blog is absolutely amazing. 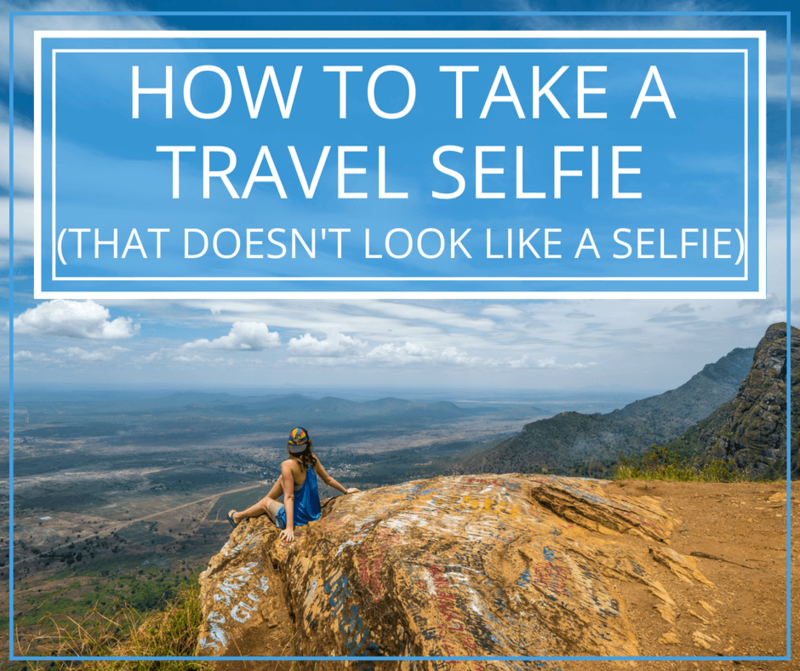 I didn’t know I needed it until I looked into solo travel and tripped upon it. Aw thank you so glad you like it!